We think every envelope should include your return address, so we include them at no extra charge. You can literally save hundreds of dollars with this amazing special! We'll add your return address on every envelope you order in the same colors and format as your invitation for a coordinated look. 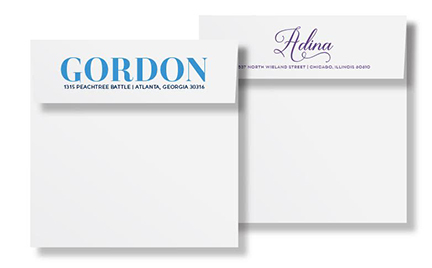 We'll address your envelopes in your invitation colors! Why struggle with envelope addressing? Simply send us your address list in a speadsheet. It's only 89¢ per name. Click for more info on addressing, including tips on setting up your list. Not sure how your invitations will look once customized with your colors and content? 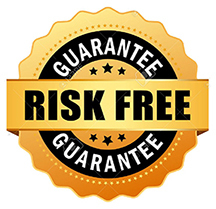 Now you can order risk free! We'll design your invitations and email you proofs to review. See them up close, and then decide the next step. We are so confident you will love your invitations we can make this unique offer. After you place your order and complete your $95 deposit, we will email your custom proofs in about 3 business days. If you'd like to make some tweaks, no worries! We offer two additional rounds of complimentary edits to ensure they are perfect. But, if you decide they just aren't for you, you may cancel your order before making any edits and receive a complete refund of your deposit. Once you submit your first round of edits, your order may not be canceled and your deposit is non refundable, so be sure to let us know before sending your initial round of edits. We challenge you to find any other company with this amazing offer! When it comes to the paper for your invitation, we tend to be pretty picky. After all, paper is the foundation of a great invitation. We've sourced the finest papers from the most prestigious paper mills. Then we did something a little crazy. We decided to give away our best papers at no extra cost. Unlike other places that tack on extra fees for their designer papers, we offer every premium paper for the same price - FREE! Choose from among our most popular papers including pearlized shimmer stocks! No hidden fees, no surprising up charges. EventPrints is faster than most every premium invitation company. 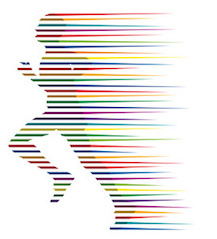 Because we do our own printing, we offer faster service than most anyone! How fast? We're glad you asked! Your first set of proofs are emailed to you in about 3 business days. Upon proof approval, your invitations are ready to ship in 5 business day (one calendar week). In comparison, many of our competitors take 3 or more weeks for printing. Adding a backer card or foil printing adds some additional time. Limited time offers subject to withdrawal without prior notice. Addressing offer is from an Excel or spreadsheet mailing list which is formatted to our specifications.